I love bridges. I LOVE bridges. I love to walk across them. I love to write about them. I love to watch documentary series about them (such as a trilogy on the bridges of Mostar, Brooklyn and the Millennium that I wrote about in 2001 and which I’ll post at some point). I salute engineers who build extraordinary bridges that are solid and enduring but still sinuous and beautiful. I especially love the Humber Bridge. It’s huge; it’s magnificent, and it crosses a huge and magnificent river. Of course I love it. And of course, when I discovered that there was a 10K race that involved running across it, I signed up. The Humber Bridge 10K was one of the first races I ever did, two years ago. I drove over to Hessle on my own, in my Kirkstall Harriers vest, and got thoroughly confused by all the purple vests until I realised that City of Hull AC also run in purple. I ran a mile up to the bridge, two miles across it, two miles back, and a mile back to the rugby club. I remember a few things about the race: that I deliberately ran on the inside of the path when we were running over the bridge, because I felt a powerful temptation to jump. Not because I was suicidal, but because the water was there. That urge is apparently a recognizable psychological one. I also remember coming into the final mile and running alongside an older man, and we pushed each other on to get sub-50, and both got 48 minutes. My time was 48:07 and I’ve yet to beat it. 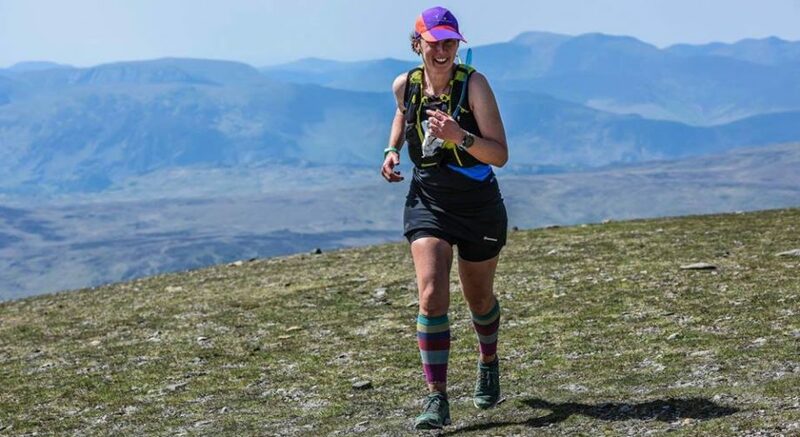 I think I came close in the Edinburgh half, although the official times – now publicly available on the website, after the race director wrote today that they realised they had made the wrong decision in not publishing results – gave me a 52 minute time at 10K. My Garmin splits work out at about 49-50 minutes but certainly not 52, so I’m not sure what happened there. Anyway at one point I thought I’d try and make this a proper race, though against myself. But then my brother, who has started running again after a couple of years off, said he’d like to do it; and then Janey said she’d do it too. So I decided to do a sociable run instead and sod the PB. In the end my brother was in Birmingham the night before and quite reasonably didn’t want to drive for nearly four hours to do a one-hour race, however spectacular, so it was just Janey and I who set off to Hessle Rugby Club on Sunday morning. The race started at 11, and we had plenty of time. Except that I was sure I knew the way, and that certainty remained until it came to a turn-off and suddenly I wasn’t sure any more, and there was no time to check phones and my map was in the boot and then, oops, there we were driving onto the bridge with no escape route. And he called into the radio that there was a “turnaround,” for us to check in with the other side when we got back, and waived the enormous £1.50 toll fee. What a lovely man. We drove over the bridge, then cleverly missed the next turn-off, so turned up 6 miles or so later at the toll-booth again, whereupon another lovely man also said, no problem, radioed in that “the turnaround is back safe” and off we went. This time we put the postcode for the rugby club into Google maps and got there with 30 minutes to spare. It’s a small race. My number was 800 and something, but there definitely weren’t 800 runners. I’d guess about 300. The weather was glorious for anyone who is not running: sunshine, heat, and no breeze. The lines for the portaloos weren’t too long, so we did our business, lined up outside along the road and then bang, we were off. I like abrupt race starts. You don’t have time to get nervous. And I liked the fact that I was going to have company. I’m getting spoiled, after Mike’s pacing last week and Janey’s company this week. We’d agreed not to tank it, but still we were running nearly eight-minute miles, which to me is fast. Though when I worked it out, I must have run faster for my PB. But it was so hot. For the first mile, running up to the bridge, I thought, there’ll be wind on the bridge. There’s always wind on the bridge. And we got to the bridge and there was no wind. 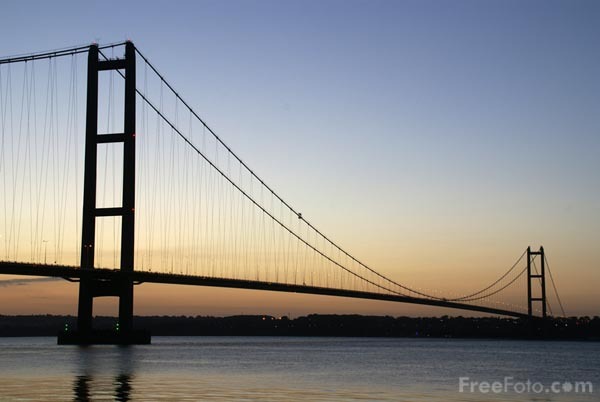 The bridge stood astride the Humber like a giant becalmed ship. Janey doesn’t like running in the heat, and it’s my least favourite weather too. I like running in the cold, the rain, drizzle, even some wind. But heat and sun are the most difficult. There was a water station at the far side of the bridge, and we stopped to have water. On the other side, Janey stopped to take pictures and I carried on, but slowly so she could catch up. I stopped a couple of times, but it was a while before we were together again, and she said that she’d been feeling the heat before but now that she’d stopped and started again, she felt bloody awful. And I thought, yes, I should and then I was. The last mile had more shade. Before that the only shade had been the shadows cast by the cables of the bridge, but they only lasted a couple of hundred metres before the shadow disappeared into the water. The final stretch is down the road to the rugby club. It’s fast and downhill so I tried to go faster. A man in front of me suddenly swayed on his feet and collapsed into the arms of a marshal, and I ran off – because he was being cared for – to the sound of another saying into his radio “there’s someone who’s not very well; send a paramedic.” I hope he’s OK. I began to look at my watch and thought, maybe I’ll do a sub-50. But I didn’t. Then I thought, maybe sub-51. But that passed too. But I managed to get to the line as the clock was ticking towards 52 minutes and I think I got in at 51:59. That’s what my watch said. The official results though said 52:00. I know. It’s daft to care about a second. I’d feel bad about that but as I’m only competing with myself, I don’t. I drank about five cups of water and we lay on the grass for a while feeling exhausted. We’d run six miles in about 23 degrees C while spending most of our time training in cool and cold weather. The race required some digestion. Then we went off to the Humber Bridge country park and had a picnic. I’ve had Janey’s picnics before and they’re delicious so this time I felt some Veggie Runner pressure, and at 8:10 that morning I had decided to make a salad with whatever was in the house or in my vegetable bed. It became a spelt, spinach, feta, radish, pumpkin seed, mixed nut salad and it was delicious. Phew. It’s a wonderful race. And if I weren’t busy on 29th June, I’d sign up for the Humber Bridge half marathon too. Fab day, especially the cooling down and the picnic! 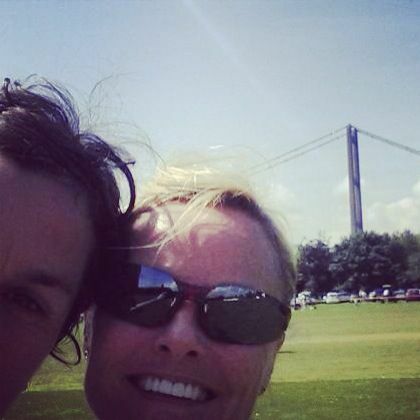 Loved the race – perfectly bonkers to run across that amazing bridge and what a view… Hot, odd, stunning, surreal. Recipe for the protein balls I made for recovery/because we like treats coming soon on the blog. Oh I forgot about the protein balls: they were DELICIOUS. Ooh sounds a fab run … despite the heat! Love the salad – sounds AMAZING!! I could totally eat that now! !